Florida Trail | Eglin Catface | Florida Hikes! 14.1 miles. 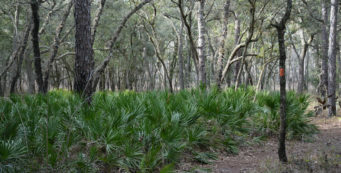 Climbing to the highest elevations along the Florida Trail, the challenging 14.1-mile Catface section leads hikers through hilly clayhills and pine flatwoods along the northern edge of Eglin Air Force Base. Keeping close to the northern edge of the military reservation, the Catface section is notable for its elevation changes. 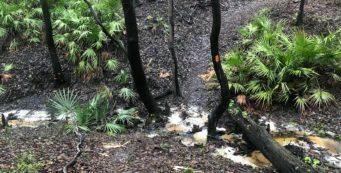 It’s one of the few places along the Florida Trail where you do have to scramble down slopes and back up again in search of water and stream crossings. 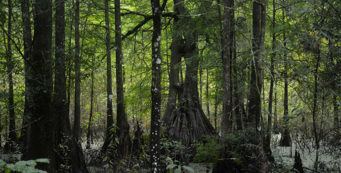 Primarily crossing oak forests and stretches of Choctawhatchee sand pine, it is generally less botanically diverse than the adjoining segments, with the exception of Anise Creek, a hotbed of Florida star anise trees. Most frequently tackled as an overnight backpacking trip, it offers two designated campsites along the route. For the eastern access to this section, Alaqua trailhead [30.706369, -86.233582] is along Bob Sikes Road, 6.6 miles west of US 331 in Defuniak Springs. It has a sloped, somewhat rough parking area adjoining the kiosk. 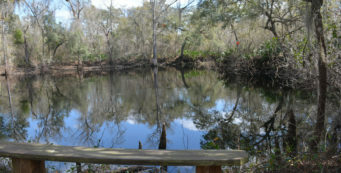 On the western end, the Old SR 285 trailhead [30.714701, -86.376221] is 2 miles south of Interstate 10 at Mossy Head. 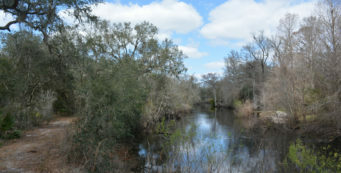 Starting out from the Alaqua trailhead, the first mile plunges you down through a beech-magnolia forest into a rare wonderland of Florida star anise trees, which sport red blooms in early spring. Climbing up into sand pine forests on the higher ridges, the trail continues along the highest elevations in this portion of Eglin Air Force Base. There is even a sign to mark the highest elevation on the Florida Trail, found not far from Bull campsite. The water source for the campsite is an adventure to reach, given the steep slopes down to it. Traversing the tops of forested sand ridges, the trail frequently slopes off into ravines below, leading you into them as each tributary crossing comes up. Some of these scrambles require stairs set into the sandy bluffs. Water here is fresh and clear, a pleasure to find and filter. Dense vegetation clusters around the waterways in these steep-sided ravines. In the high spaces between them, sand pine – and former sand pine plantations undergoing restoration to clayhill habitat – is the most common forest you’ll traverse, with puffs of seafoam colored deer moss sprouting from the pine duff. 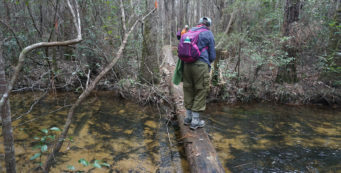 As elevations begin to drop, the trail settles into some marshy areas, particularly as it approaches the branches of Hog Creek. Bog bridges generally prevent wet feet. Red Deer campsite is the second campsite along this segment, and has more pleasant wooded areas in which to pitch a tent. Both campsites – and much of this segment of trail – suffer from proximity to Interstate 10. Noise carries, especially after dark. Dropping down and over Red Deer and Wise Creeks, the trail crosses SR 285 and follows the crumbling asphalt of the old highway for a stretch before this section ends at the Old SR 285 trailhead.